Due to the warm and humid climate, disease management in the Southeastern United States presents a unique and often difficult challenge for apple producers. While practices for controlling apple diseases must occur throughout the calendar year, the most intensive management period occurs from silver tip and continues until the crop is harvested. For many late-harvest cultivars such as “Pink Lady” this equates to an eight month production season that requires over 25 fungicide and bactericide applications to attain commercially acceptable levels of disease control. Besides pesticide applications, cultural management strategies for disease mitigation are regularly practiced by Southeastern apple growers. Such cultural practices may include urea applications or flail mowing to reduce overwintering disease inoculum, pruning to remove cankers and decrease humidity within the canopy. 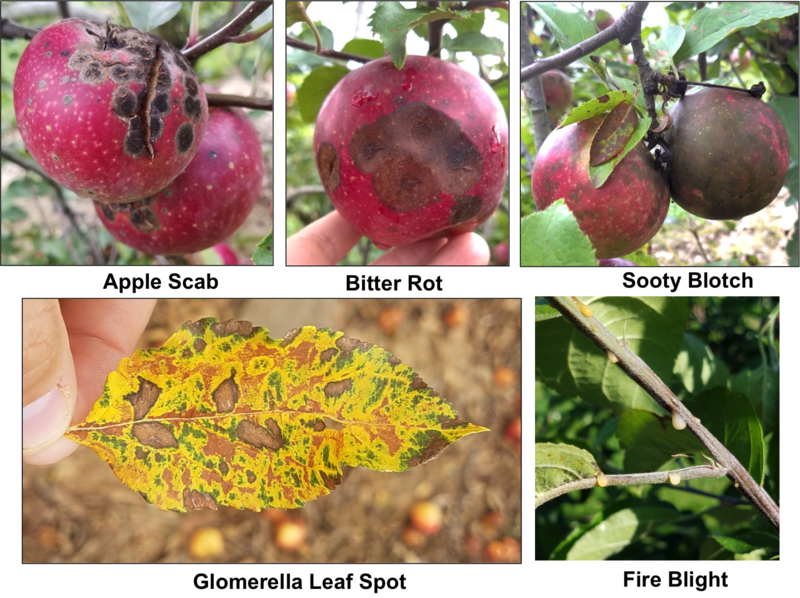 Below are photos of some of the more common apple diseases observe in North Carolina.